This post is sponsored by Basic Invite. I was gifted business cards to review. All thoughts and opinions expressed in this post are genuine. It’s a new school year, and while my personal school days are long gone (at least for now), I feel programmed with the desire to buy new stationery and organizing materials. Instead of a new Five Star and lined notebooks, I’m a sucker for buying a pretty new planner, desk calendar, notecards and business cards. My personalized clear business cards c/o Basic Invite. Until recent years, I had business cards covered through work and my professional identity at that time. 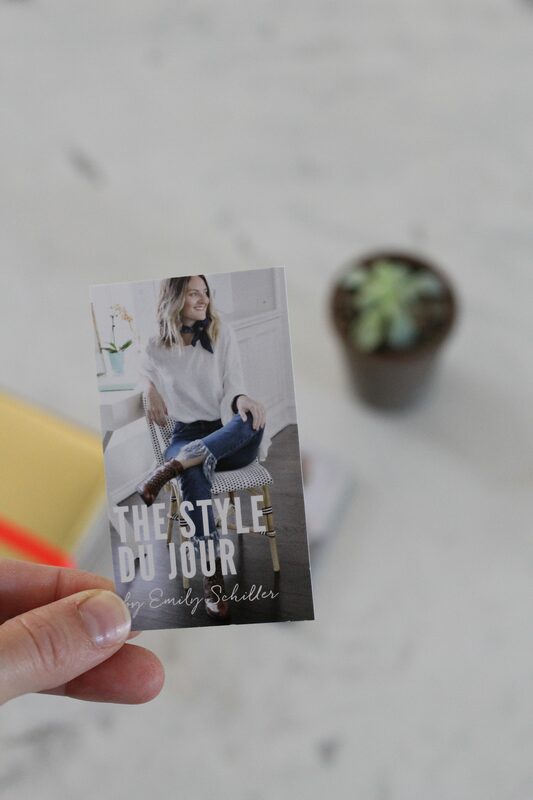 Since staying home full-time with my kids the last few years and trying on various hats (e.g., nutrition communications consultant, lifestyle blogger), I’ve found it important to have my own set of professional business cards to have on hand for events, written thank you’s and networking. 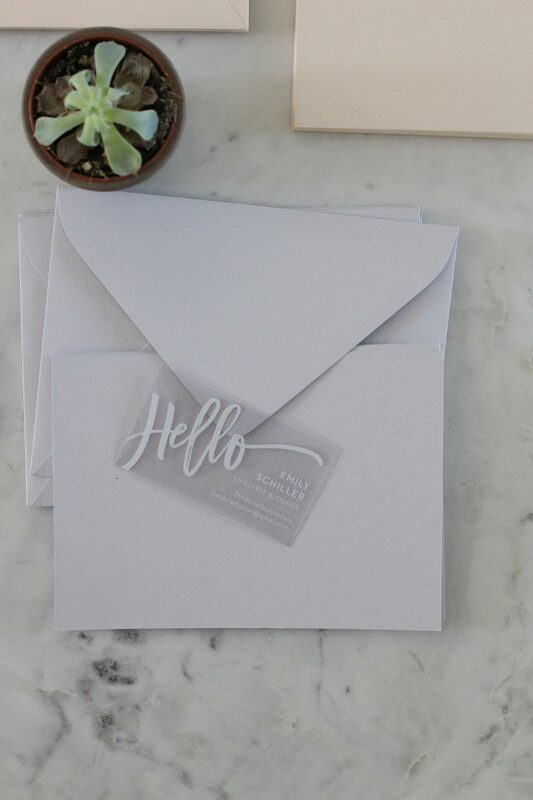 Thanks to Basic Invite, an e-retailer with boutique quality stationery (and websites) that you can personalize for every life event or holiday, I was able to create these new gorgeous business cards. 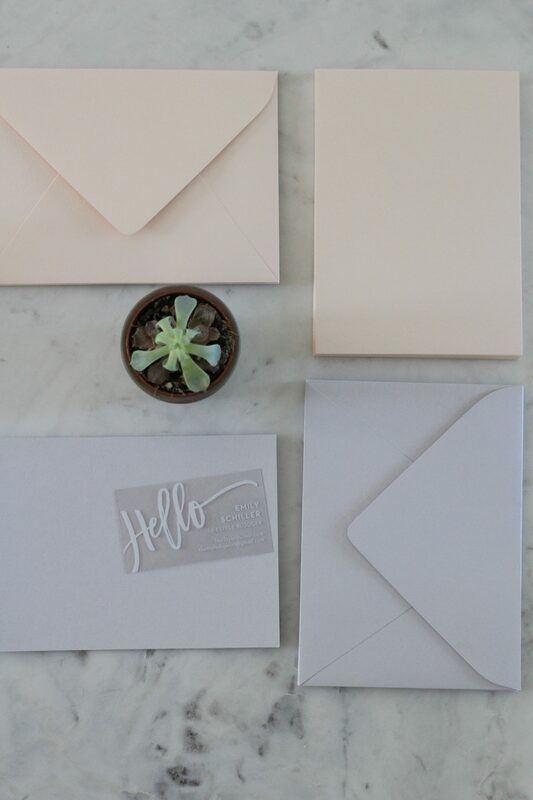 What stands out to me is that Basic Invite’s selection of business card templates are anything but basic. 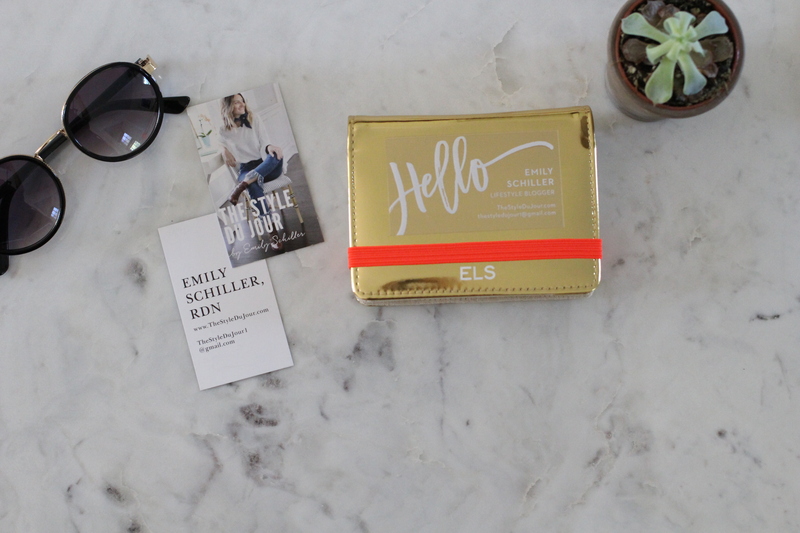 They are modern and clean, with plenty of personalization options like foil detailing (in gold, silver and rose gold – love!) and photo inclusion to make them truly unique. 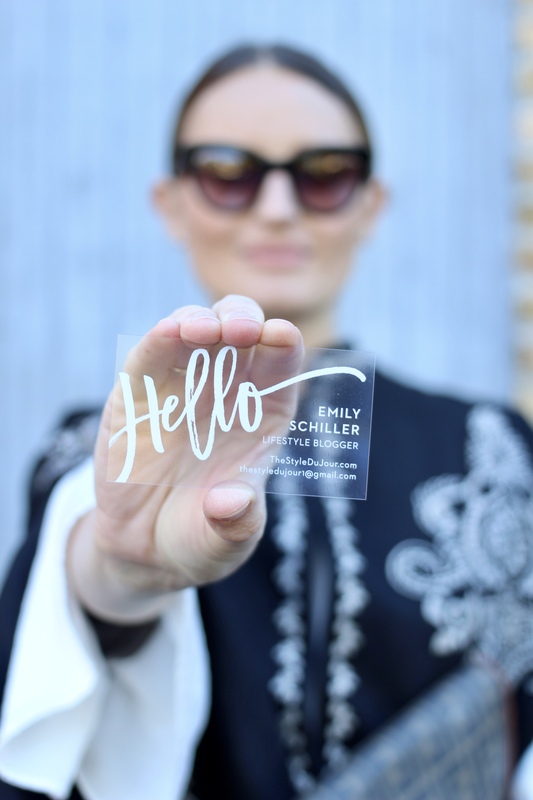 The clear, plastic business cards immediately stood out to me as a modern take that I had to try. There were so many cute templates to choose from that I printed another two-sided business card featuring a full-bleed personal photo. (This is the template I used to create the card below.) I like that there is no minimum quantity so you can order small batches at a time if you prefer. 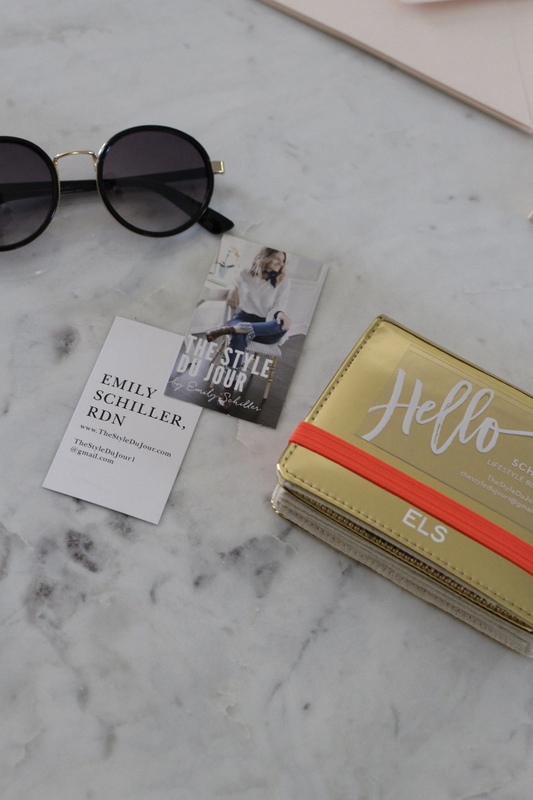 Whether you’re a blogger, artist, freelancer or professional of any type, Basic Invite has a stunning selection of business cards to create unique branding and leave a lasting impression. When I was little, my mom would make rice pudding from dinner leftovers. She’d whip it up with raisins and it was always topped with a healthy dash of cinnamon. To this day, rice pudding is one of my go-to comfort foods. Served warm or cold from the fridge, it’s all delicious to me. I’ve been craving rice pudding more often these days, so I’ve been experimenting with my rice pudding ingredients to create a version I feel good eating on the daily. Made with whole grain brown rice, reduced-fat milk and sweet raisins, this version makes for a wholesome breakfast or mid-day snack. For years, I made rice pudding in the oven, but more recently I’ve been making mine on the stove which creates a super creamy and rich-tasting pudding every time. It’s passed the extended family taste test and, most importantly, the toddler taste test. A healthy dash of cinnamon, orange zest, fresh orange juice and vanilla extract kick up the flavor a bit, too. This recipe makes about 3 1/2 cups of rice pudding which makes about five-six portions for us. Combine all ingredients in a medium-sized saucepan: 2 cups of cooked brown rice (I always use Trader Joe’s cooked, frozen bagged brown rice), 3 cups of 2% milk, 1/3 cup of sugar and 1/2 cup of raisins. Add a pinch of salt, splash of pure vanilla extract (approximately 2 teaspoons), a dash of cinnamon (more or less depending on your preference), orange zest from one medium-sized orange and a splash of fresh orange juice (approximately 1 tablespoon). Stir ingredients together. Bring to a rolling boil and lower the heat (between simmer and low). Cook for about 20-25 minutes, stirring often. Once the milk is absorbed and the rice pudding is thickened, turn off heat. Let sit about five minutes and serve warm or transfer pudding to a small casserole dish or individual bowls/mason jars for cooling and storing in the fridge. Enjoy cold or re-heat in the microwave. This recipe is a great way to get more whole grains in your day and introduce (sneak) more whole grains into your kids diet. If you’re an oatmeal breakfast lover, try this brown rice pudding for a little change-up in your morning routine. Experiment with the ingredients – use your milk of choice, less sugar or other dried fruit like dried cherries – to create your favorite version. If you do, please share your favorite version with me! As a mom with little ones, water safety has always been a priority. Whether it was bath time or beach time, there were clear rules with how we operated with the kids around water. Mainly me being a paranoid wreck and using far too many flotation devices on our children (bath tubs excluded). That said, it wasn’t until we moved into our home with a swimming pool in the backyard that learning water safety and mastering swimming skills simply became the priority and perhaps take precedence over some other enrichment activities at the moment. When I learned there was a Goldfish Swim School nearby, we were eager to get our four year old in the water. This wasn’t his first swim class, but his first class swimming on his own and as part of a diligent swim program. To say we’re impressed with Goldfish and Teddy’s swimming improvement is an understatement. When Teddy first started back in January, he was weary of going underwater or even getting his face wet at all. Now he’s jumping off the ledge and kicking off the side with his head underwater. The class sizes are small – typically three to four kids – which makes for tons of one-on-one time with the instructors. Plus, we’ve noticed Teddy push himself among his classmates who often cheer on and encourage each other. There hasn’t been a day Teddy hasn’t been eager to set off for swimming – even in the dead of gloomy winter – and he has a blast the entire time. As a parent, there’s nothing more heartwarming than to see your child tackle a new skill and with so much joy at the same time. As spectators, we’ve come to look forward to our Goldfish Swim School days, too. The facility is immaculate and has all the amenities you’d ever want – comfortable chairs for the parents, a heated pool deck, a fun play area for the younger siblings, and a spacious changing and shower area. Plus, everything is decked out like a day at the beach complete with sea life murals, tiki hut-inspired umbrellas, surfboard benches and a giant fish aquarium. Beyond aesthetics, the swim instructors are well-trained, the curriculum is thorough and so are the updates you receive as parents. After every class, the instructor gives us a personal update on Teddy’s progress. In honor of National Water Safety Month this May and with the summer around the corner, I wanted to share our positive experience with Goldfish Swim School as we master this important life skill. Goldfish Swim Schools are located across the country, so if you’re looking for a quality swim program for your kids as we gear up for summer, check to see if they are in your area. Palm Springs, California has been our spring break destination since I was a kid so I adore that my parents have continued the vacation tradition with me, my three siblings and our growing families. It’s a gem of a town and I love to see the city bloom with new boutique hotels, restaurants and shopping while maintaining its mid-century modern charm. While lounging and playing by the pool every day is quite fine by me, those of you with little ones know how key it is to keep things interesting. If you’ve traveled to Palm Springs before or are prepping for a trip to the area soon, then you may have added things like the Palm Springs Aerial Tramway, Cabazon Dinosaurs or the Children’s Discovery Museum of the Desert to your kid-friendly activities list. We explored the Morrten Botanical Gardens for the first time this year and we loved it! The garden isn’t super large in size making it an ideal place to take younger kids. The garden includes a walking path, the indoor Cactarium and a nursery. A highlight for the kids was watching the giant tortouise, Tank, and his smaller tortoise friends. Bonus: Kids under five are admitted free. Adults are only $5.00. It’s also a picturesque spot to capture photos. Tank, the tortoise, with his smaller pal enjoying lunch. The Living Desert is located a quick drive from Palm Springs (about 35 minutes). It not only has animals from North American desert regions, but also African animals like giraffes, hippos and cheetahs. In addition to the animal exhibits, there are walking trails and a huge outdoor miniature train model. Get there early when the zoo opens so you can explore before the heat gets too hot. The zoo is spread out making for picturesque walks, but for little ones, I recommend bringing a stroller or wagon to help them make it around the grounds without melting. This outfit was my uniform two days in a row (no shame!) for our Botanic Garden and The Living Desert adventures. Thankfully I had these “Piper” Jambu sandals which are made with soft Memory Foam so I had no problem walking for miles in the heat. I was also impressed with how clean and like new my sandals appeared after walking around in desert dirt and sand for two days. The buttery leather and denim material makes it easy to wipe clean. Get my review of Jambu Spring Collection heels and check out one of my favorite pairs in my recent post. P.S. Use code DUJOUR18 to save 10% on these shoes and any others from Jambu.com. If you’re planning a trip to Palm Springs, California with your family, keep the Moorten Botanical Gardens and The Living Desert on your itinerary. If you’re a Palm Springs traveler, do you have any other favorite spots for your family? As always, I’d love to hear from you!